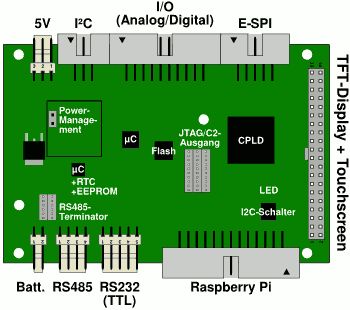 The AdvaBoard RPi1 is an extension-board for the Raspberry Pi, incl. a real-time-clock, various (5V-tolerant) interfaces on dedicated connectors, digital- and analog-I/Os, an integrated power-management incl. battery power and an optional TFT-display (2.4" - 7.0") with touchscreen. So, the AdvaBoard widely extends the possible field of application of the Raspberry Pi and upgrades it to an universal small embedded industrial PC. It's easy to connect different sensors, additional I/Os, CPLD- and microcontroller-boards, control components (e.g. motors) and even further TFT-displays on the interfaces (I2C, E-SPI, RS-485, RS-232). The provided software includes a complete program library for C and Python and some open example programs, which allow a very fast startup, and may serve as base for own programs. Additionally, the Raspberry Pi and the AdvaBoard can be controlled via JSON-RPC over a network connection. Besides, a framebuffer-driver is available, so the TFT-display (which is connected to the AdvaBoard) can be used as default Linux-display. Moreover, we can offer an extensive support incl. development support, modified hardware (e.g. 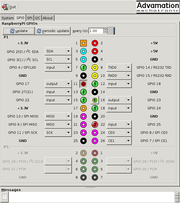 adapted input-ranges of the analog-inputs) and specialized firmware (CPLD, microcontroller) for your application. 10 digital-I/Os, 3.3V, 5V-tolerant, incl. 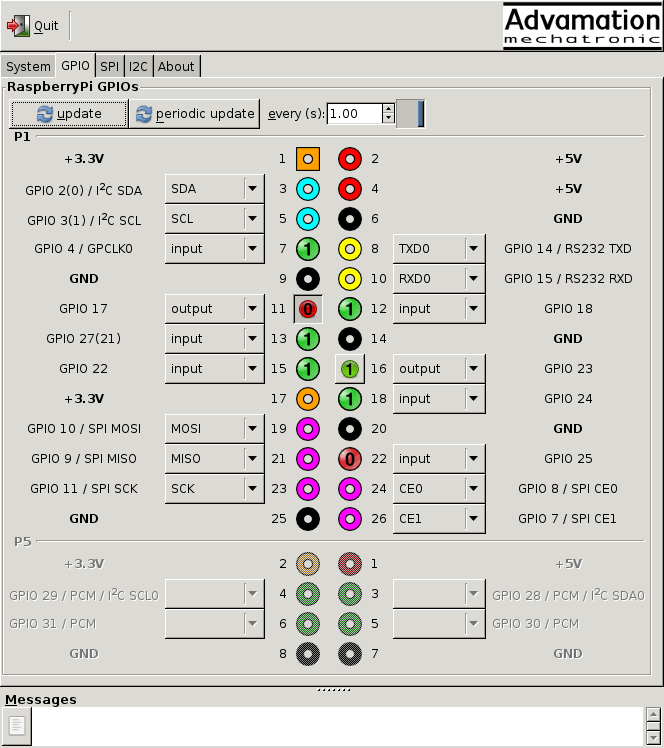 PWM, counter, optional hardware-supported processing by the CPLD etc. At the moment, several working prototypes exists, and we're preparing the serial production. Most of this software is Open Source under a MIT/X11-like license, which means that the sourcecode is freely available and may also be integrated into proprietary software. So, the provided example programs can serve as base for your own applications. 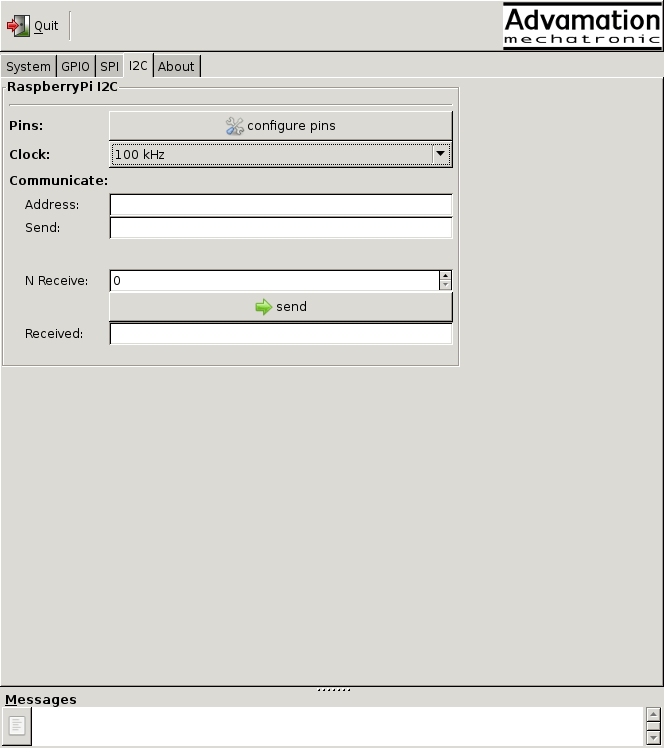 As demonstration, you'll find some screenshots of an example program (written in Python + GTK) below, which runs on a PC, connects with JSON-RPC over Ethernet to the Raspberry Pi and controls its I/Os. 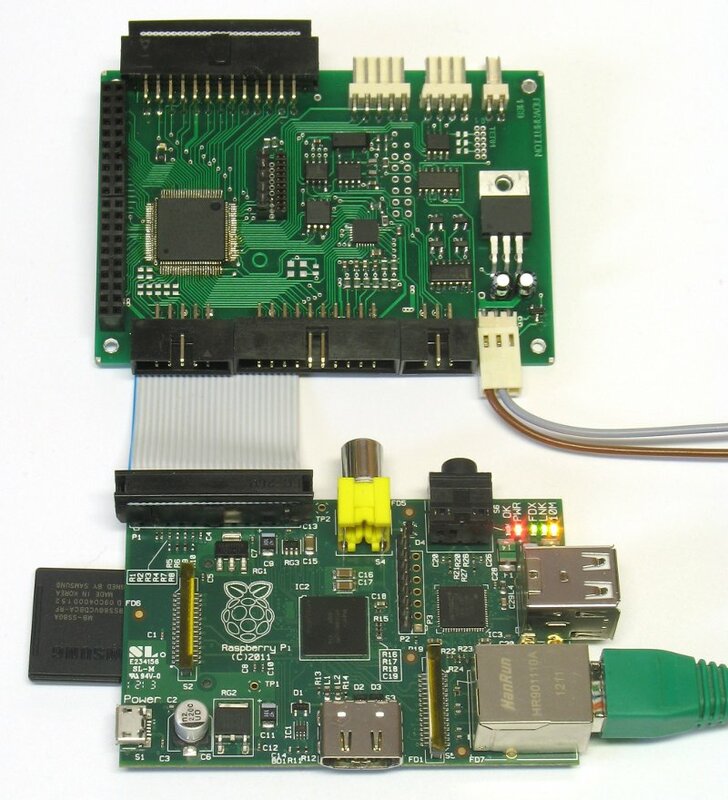 Hence, this program is ideal for starting up and testing the Raspberry Pi, the AdvaBoard and external periphery. The AdvaBoard RPi1 an either be stacked directly above or below a Raspberry Pi, or mounted separately. Unfortunately, the Raspberry Pi itself does not contain a real-time clock, so you usually have to either manually enter the current time and date or obtain them from the network (NTP) every time you boot your Raspberry Pi. The AdvaBoard RPi1 solves this problem, by providing the Raspberry Pi with a (battery-backed) real-time clock. 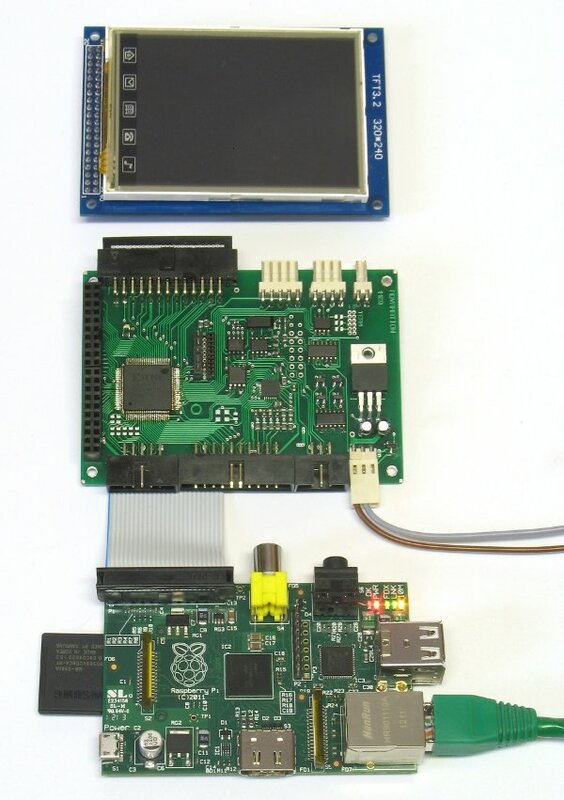 In addition, the real-time clock can be used to power-up the Raspberry Pi and the AdvaBoard on a certain time or in certain intervals (see power-supply / power-management ), or to trigger some actions. But there may always be only one of the two power supplies (5V-power-supply-connector on the AdvaBoard or power-supply on the Raspberry Pi), never both! Thereby, the AdvaBoard is perfectly suited for running from a larger battery or for self-contained operation with a solar panel, since the complete system (except the battery-powered real-time clock and maybe some I2C-sensors) can turn itself off, and wake up again depending on time or events. Directly after wakeup, the integrated microcontroller works and can e.g. poll some sensors and turn on additional components or the Raspberry Pi when needed. To wake the AdvaBoard up, you can use a simple button, I2C-sensors with interrupt-output or an I2C-board including a microcontroller, which e.g. monitors some sensors. A 26-way ribbon cable is used to connect the AdvaBoard RPi1 with the Raspberry Pi. The I2C-bus is by now the interface for digital sensors, e.g. for temperature-sensors, temperature-/humidity-sensors, acceleration-sensors, motion detectors etc. The pinout was thereby chosen in a way to minimize the crosstalk between SDA, SCL and the interrupt wire. 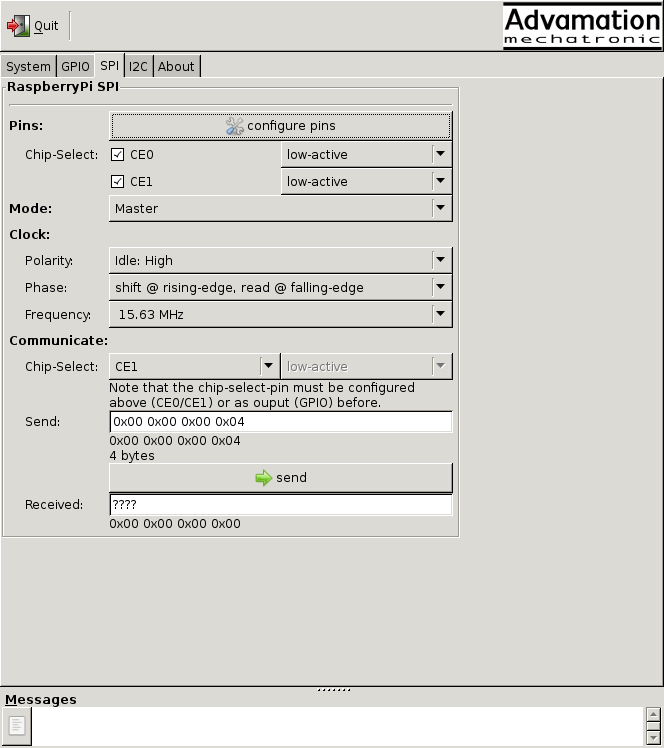 The SPI-interface offers a simple and very fast serial bus. It's especially suited for periphery which needs a high data rate or low latency, e.g. 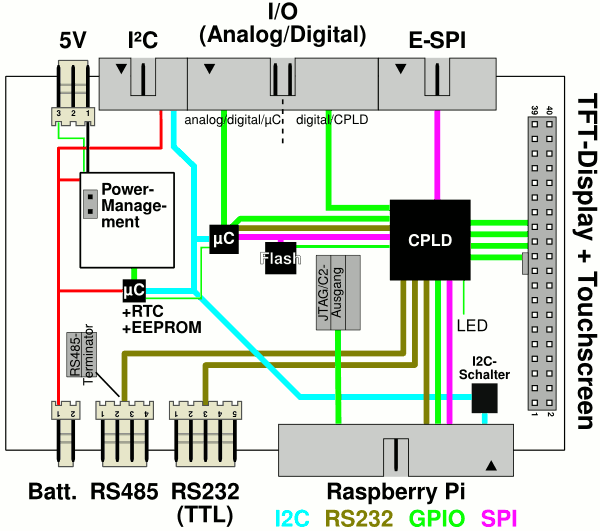 external CPLDs/FPGAs, displays etc. The additional address-wires can either be used as normal chip-selects to altogether select 5 SPI-devices, or to select up to 16 devices with additional address-decoders. So, the "E-SPI" is perfectly suited to easily connect up to 16 external boards with ribbon cables to the AdvaBoard. The address decoders can also include an interrupt logic, enabling the SPI-slaves to trigger interrupts (without any additional wires). All digital-I/Os use 3.3V levels and are 5V-tolerant. If you need more I/Os for some application, you can connect external I/O-boards to the AdvaBoard via I2C, E-SPI or RS-485. The RS-485-interface is a robust and interference-proof industrial interface, which can be used to connect several devices (partly with hubs), and which is also suited for longer distances. In addition to the RS-485-interface, the AdvaBoard also contains a RS-485-terminator, which can be activated/deactivated by a jumper. Furthermore, it's possible to use an automatic bit-modification to address the devices, which is e.g. necessary for the Advamation-RS-485-protocol. 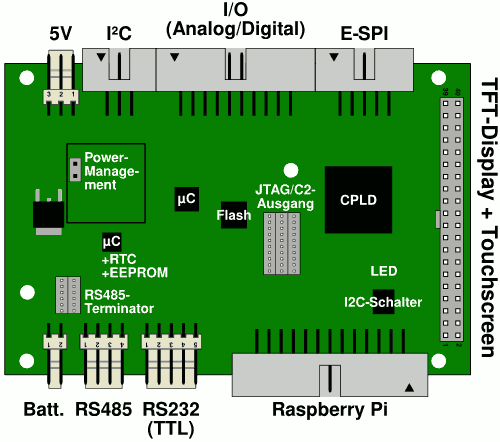 The integrated RS-232-interface with TTL-levels can be used to connect various periphery, like e.g. a GPS or a radio module. There's also a level-shifter available, which converts this interface to a normal RS-232-interface (with DB-9 female jack), and a USB-RS-232-adaptercable to connect this interface to USB. The AdvaBoard contains an interface incl. controlling logic for digital TFT-displays. These displays can either be directly plugged/stacked on the AdvaBoard (and mounted to it), or connected to it with a ribbon cable and mounted separately. There are currently TFT-displays available in the sizes 3.2" (320× 240), 4.3" (480×272), 5" (800×480) and 7" (800×480) -- all including a resistive touchscreen. The displays are fixed to a PCB which contains mounting holes, so the displays can be mounted to a front panel. Additionally, all displays contain a SD-card-slot. 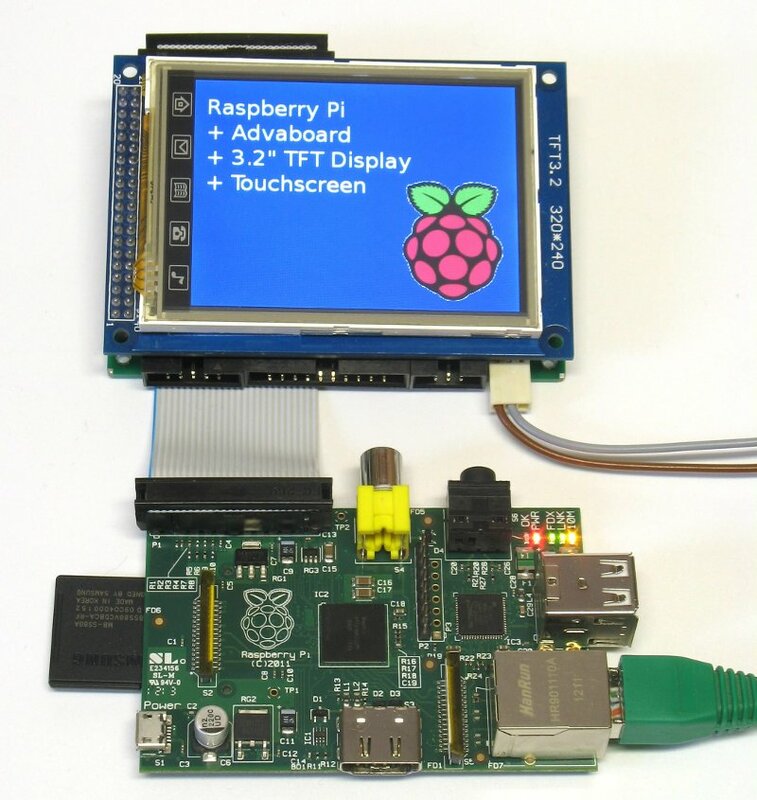 Since the displays are controlled without using the Raspberry-Pi graphics chip, they are not intended for playing video or similar, but rather for graphical user interfaces (GUI) or as interactive data-display. However, framerates up to 50 fps (nearly 4 MPixel/s) can be achieved with the 3.2" display. The display can be controlled both by the Raspberry Pi and the microcontroller of the AdvaBoard (e.g. to display a startup-screen). A framebuffer-driver, to use the display as default Linux-display (incl. X11), is also available. In the future, it will be possible to connect additional TFT-displays to the AdvaBoard RPi1 via E-SPI. For special applications, and when using an adapted version of the AdvaBoard and a special CPLD-firmware, it would even be possible to use the display-interface-pins as generic CPLD-I/Os (incl. hardware-supported processing by the CPLD). 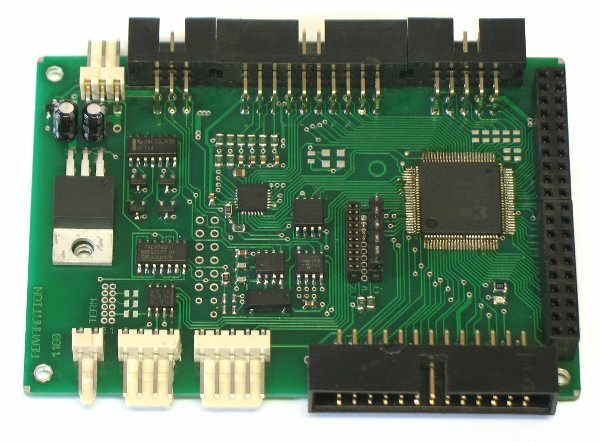 The AdvaBoard includes a JTAG- and a C2-output, which can be used to program Xilinx CPLDs/FPGAs and SiLabs C8051-microcontrollers. So, you don't need a separate programmer for external Xilinx-CPLD- or SiLabs-microcontroller-boards. It's also possible to use these interfaces to update the AdvaBoard-firmware, e.g. to add further functionality later or to adapt the AdvaBoard to special applications.